A rose by any other name sometimes smells, and tastes a bit sweeter. Given the holiday season, temptations with sweet foods abound, but I’ve successfully avoided most office gatherings and cookie exchanges. But there is never a good time to give up wine, especially those that go with heavy foods and big tastes. So when my friend drove in from DC, made some sausage-laced spaghetti in a big, rich and well-cared for sauce, and then asked, do you have any wine that would go with this, I of course dove into the Italian style of an Amarone. 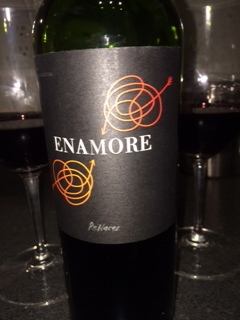 Cue the wine: “Enamore” (“to be in love”) by Allegrini and Renacer in Mendoza, Argentina. Even though not from Italy, you’ll still fall in love with what those in the southern hemisphere can do with this style of wine.According to other bloggers, Renacer means, “Rebirth” and this take on the Italian style Amarone, or appassimento (to dry and shrivel in Italian) is a rebirth of a classic. And true to it’s name, I’m in love with it. The wine is comprised of Malbec, Cabernet Franc, Cabernet Sauvignon and Bonarda grapes, and the color is a deep ruby red that borders on purple. If love hurts, this is the color I want it to be. (I know–I needed to save this post for Valentine’s day if I keep making bad puns and references). On the nose are notes of deep red and blackberry fruits and baked sugar, raisin, oak, and hints of chocolate, smoke and other earthy spices. While the wine is full of tannin, acid and body (and alcohol at 14.5%), it has well-balanced, rich and complex flavors of dried baked plumbs, raisins and the spice and chocolate notes mentioned above. This is your favorite red wagon you had as a kid, lined with velvet and fur, driven by horses. The wine has power and elegance and is an affordable take–at $20 a bottle– on an old favorite. (In Minnesota, I found this at the downtown Minneapolis Haskell’s location). Grab a bottle and share with your friends or spend the night in watching your favorite black and white movie. You know you’re in love with it if you, too, miss the workout. I did.